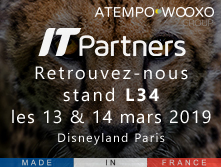 Atempo-Wooxo are at IT Partners, the professional IT Channel event on the 13th and 14th March 2019 in Disneyland Paris – Stand L-34. Discover our new vision which places data at the heart of the ecosystem. It shines a light on the importance of data circulation within each organization. This event will also be the occasion for the two French vendors to present their new and complementary solutions to protect data ecosystems. The Cybersecurity Pack and OneClick Restart: France Cybersecurity solution which includes a complete network backup, externalization, immediate DR from an appliance (OneClick Restart), an ultra rapid data recovery service via a simple insertion of a USB key (OneKey Restore) and proactive service monitoring.